The all-party 2M Group says Heathrow's new proposals for a third runway will be followed by demands for a fourth. 2M, which is a campaign group of more than 20 councils affected by Heathrow, is also challenging the airport's claims that it can reduce noise suffering while increasing the number of flights over London. The councils say that noise nuisance data used by the airport is 30 years out-of-date and understates the number of people who suffer under the existing and proposed flightpaths. “Heathrow might be offering a choice over where their next runway goes but we they won’t stop until they have four. Some parts of London and the Home Counties may escape the new flightpaths this time round but the peace won’t last for long. “To claim they can reduce noise while increasing the number flights over London is a complete sham and won’t stand up to scientific scrutiny. They grossly understate the number of people who suffer under their existing flightpaths and continue that trend with these projections. We calculate that around three million people will be affected by aircraft noise if the airport expands to four runways. Heathrow revealed its latest expansion plans in a submission to the Government's aviation commission. 2M has consistently argued that Heathrow will not stop expanding if granted a third landing strip. 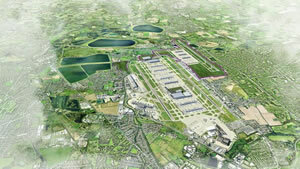 Its main European rivals have four or more runways and Heathrow will seek to match their capacity. Charles de Gaulle, Heathrow's nearest rival, has four runways. Frankfurt and Barajas (Madrid) also have four and Schiphol ( Amsterdam ) has six. Heathrow has pledged not to consider any options for a fourth runway before 2040. HACAN, representing residents under the Heathrow flight paths, vowed to ‘fight tooth and nail’ against the proposals for a third runway released by Heathrow Airport. The campaign group welcomed the measures announced by the airport to cut noise but argued that these will be negated by the huge increase there will be in the number of planes using Heathrow if a third runway is given the go-ahead. Heathrow today confirmed that flight numbers will rise by nearly 250,000 a year to a total of 740,000 if a new runway is built. On behalf of Hounslow Council, Cllr Ellar said: “Undoubtedly, new parts of our borough would be hit hard by the south west runway proposal at Stanwell Moor. The north runway – the Sipson option - which unlike its predecessor is a full-length runway, would also have a profoundly negative impact. “The north-west runway, which would cut across the M25, is a surprising development and we would need to examine its potential impact further. With all of these options, we will be carrying out detailed work to understand the noise impact on our communities. ”The submission makes the right noises about noise insulation, but there is no detail yet in respect of the cost of the scheme, and crucially who would pay for it. “The proposal to use only one runway for very late night or early morning departures and arrivals is potentially welcome for our residents, whose night’s sleep is disturbed, but again we would need to see the detail. Mary Macleod, Conservative MP for Brentford and Isleworth commented "It has been estimated that the number of flights into Heathrow could more than double with the third runway and that around one million residents across London could be impacted by aircraft noise – something that I believe cannot be allowed to happen." Mary promised to fight against a third runway. Boris Johnson suggested three new sites: on the Isle of Grain in north Kent; at Stansted; or on an artificial island in the middle of the Thames estuary and that Heathrow could become a new town housing up to 250,000 people. Commenting on Boris' suggestions, Cllr Peter Thompson, Leader of Hounslow Conservatives stated “We have always argued that Heathrow should be better and not bigger and that remains the position of Hounslow Conservatives. We fully agree with the Mayor that any expansion of Heathrow would be intolerable for local residents. We also agree that something needs to be done to end Britain's chronic shortage of air capacity and it’s good that we have a mayor who is able to think big and explore all options. However Heathrow will always be a major player in our airport provision. The idea of digging it up and replacing it with a new London borough isn’t one we are going with." A public helpline for residents seeking more information about the proposals has been launched. That number is 0800 307 7996. Residents can also go to www.heathrow.com/localcommunity or email communityrelations@heathrow.com for further information.